Simulation showing the production of the Higgs boson in the collision of two protons at the Large Hadron Collider. The Higgs boson quickly decays into four muons, which are a type of heavy electron that is not absorbed by the detector. The tracks of the muons are shown in yellow. Paul Sutter is an astrophysicist at The Ohio State Universityand the chief scientist at COSI Science Center. Sutter is also host of Ask a Spaceman, RealSpace and COSI Science Now. 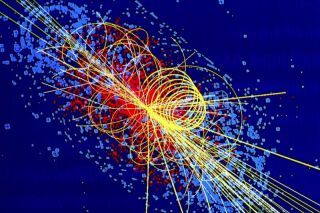 I'm sure by now we've all heard the refrain: "The Higgs boson creates mass." And if you haven't heard it, well, now you have. This simple statement seems to pack a wallop of a concept: that every pound and gram of your body, down at the submicroscopic scale, is due to this invisible Higgs goo that fills up the universe. The Higgs boson does indeed play a role in mass, but it's much less significant than you might think. Zooming in on you, we find that your body is made of organs, which are made of tissues, which are made of cells, which are made of molecules, which are made of atoms. Atoms have a nucleus surrounded by a cloud of electrons, and those electrons are incredibly wimpy — so insignificant that for most mass calculations they can simply be ignored. Digging into the atomic nucleus, we find protons and neutrons, the meat and potatoes of the atom. But they too are made of even-smaller components — the quarks. Each proton and neutron is composed of a triplet of quarks tightly bound together by gluons, the carriers of the strong nuclear force. And here's where it gets really weird. If you added up the masses of the three quarks that comprise each proton or neutron, you would only end up with around 1 percent of the total mass. That's right. The total mass of all the fundamental parts of you (electrons and quarks) is just a laughably tiny part of your weight. Instead, most of the blame for tipping the scales is the energy of the interactions between your parts. Those gluons holding the protons and neutrons together are massless, but the very fact that they're doing their job — that is, gluing — gives rise to a binding energy. It costs energy to rip apart a proton or neutron, and since we live in a universe where E=mc2, energy is mass (the c for the speed of light just tells us how much energy is in a bit of mass; the fundamental concept in that famous relation is that mass and energy are totally equivalent). Hence, most of your mass is really the binding energy of your protons and neutrons. And none of that has anything to do with the Higgs boson. But the impressive-sounding statements about the fundamental connection between the Higgs and mass aren't all subatomic smoke and mirrors. The Higgs does play a (small) role here: It's the explanation for the mass of your parts, the electrons and quarks themselves. Even though they aren't very heavy, they're not entirely massless, and they can thank the Higgs for that. I'm not the biggest fan of these viscous comparisons. They make it seem like movement is the key to the relationship between the Higgs and particle mass. As if the only way that an electron can acquire mass is by traveling through the murkiness of the Higgs field around us. To me, metaphors like this fall far short of describing the true nature of the relationship. Instead, when metaphors fail, it's best to retreat to the safety of the mathematics. After all, the game of physics is to use mathematics to describe the workings of the universe; it's in the math that relationships are described and discovered. Descriptions of those relationships using a natural language are always going to come up a little bit short. When it comes to the Higgs and electrons, the mathematics is very clear. When we allow for the existence of a universe-filling Higgs field, that field has certain properties, based on the work that field has to do to split the weak nuclear force from its electromagnetic sibling. And we're free to ask: Given such-and-such field with such-and-such list of properties, does it interact with anything else? And indeed it does: The Higgs field interacts with the electron field, the quark fields and all the other lepton fields. And it interacts with those other fields in a very specific place in the mathematical formulas that physicists use to describe their nature and evolution: The Higgs pops up in the exact spot where we usually put the mass of the particle. So there it is. Let the math speak for itself for once in its life. The mass of an electron — or the mass of a quark or any other lepton — is its interaction with the Higgs field. No syrup, no sticky paper, no buzzing flies. No metaphors, analogies, or similes. Just a plain, bare, naked statement of dumbfounding fact. What is the mass of an electron? It's the interaction between an electron and the Higgs field. And that's all there is to it. Learn more by listening to the episode "Why is the Higgs boson important? (Part 2)" on the Ask a Spaceman podcast, available on iTunes and on the web at http://www.askaspaceman.com. Thanks to Jamie R., James S., @croftandi, Peter S., Lorraine C for the questions that led to this piece! Ask your own question on Twitter using #AskASpaceman or by following Paul @PaulMattSutter and facebook.com/PaulMattSutter.